The Fourth » Happy 6th anniversary! Six years!! Dang, that’s quite a while! Honestly, when we started the comic just after our sophomore year in college, Victor and I never expected it would take this long to get into the meat of the plot. But we also didn’t count on Chapter Zero, or the fact that the working world would be harder on our spirits than school ever was. However, we’re on the edge of some really exciting stuff – we’ve had some discussions about when we’re going to make certain long-awaited reveals, and are about to dive into stories I’ve been excited to explore for years. And hey, in those six years, I’ve had a lot of time to become a better artist and comic-crafter! There may be no better testament to how far I’ve come than to compare our first banner with the one we have now. This anniversary has me reaffirming certain commitments to the comic and characters I love so much. When Victor’s not able to write but I’m able to draw, I’ll be working on more bonus illustrations and wallpapers (including this one, which will be altered into appropriate sizes). I’ve also had enough time away from Chapter Zero by now that I’m ready to go back in and start touching it up. When that’s done, you can expect to see it as an isolated PDF you can share with people you think might be interested, and maybe even in print! From here on out, it’s going to be an exciting time for The Fourth. Tell your friends! And thanks, as always, for reading! It means so very much to us. Looking at the two banners, looks like our Master of Darkness has gotten a bit of an appreciation for armor as time has gone by. Plus, the clasp got a bit bigger. 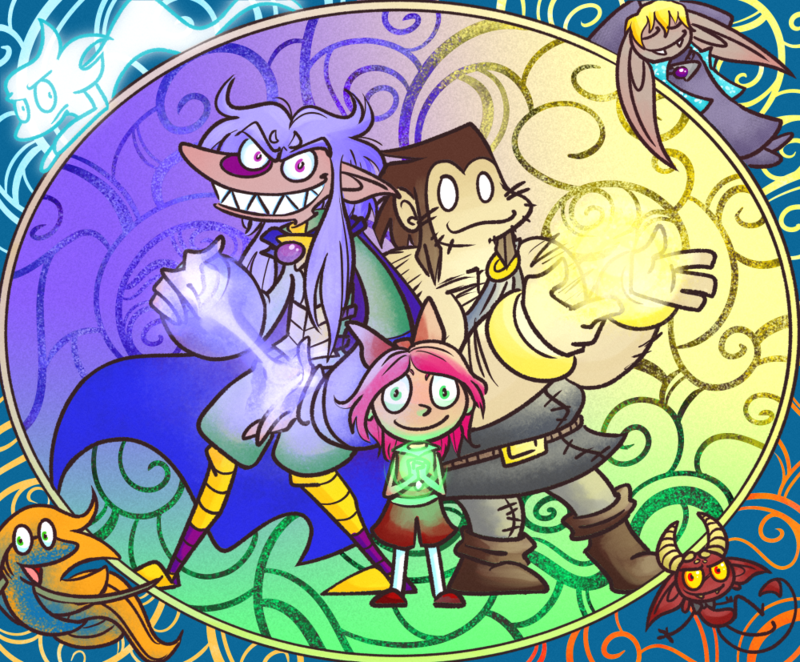 The silly thing is he’s always had his stomach guard in the comic, and in every other early piece of art since the first, I just… didn’t draw it on the banner for some reason?? He’s half dressed! What was I doing! What a difference six years makes! I’m diggin’ it! Just barely squeaking in here with 1 minute to spare (your time at least), but happy sixth anniversary! Thanks for six years of quality entertainment! Hopefully I should be able to knock out some fanart for you guys within the next few days. Well, the art will continue to improve for sure! Thanks again!! It’s on the fan art page now! But CONGRATULATIONS ON YOUR 6TH YEAR! That’s so exciting, I’m so happy for you guys and I look forward to more comics! I also look forward to looking at what I’ve missed. Been so skattered brain. I’ve got a late anniversary pic in the works I hope to get done soon. You know, Atlas Games was mimicking medieval style when they came out with their fifth edition Ars Magica covers, but I have to ask, is this something of a homage to the angel, faerie, dragon, devil border they’ve used to their covers? The coloring isn’t right on, but it’s pretty close too. Anyway, I’d find it really cool if you were doing that. I can see why you might think that, but I’d never seen those before! This wasn’t inspired by anything in particular. Ah okay. But I take it you did see one of the covers? Like I said, they took it from the style of, I guess, illumination for the Middle Ages, but I think the concept’s been used a bit both then and after. That’s a shame, I was hoping for more people involved in that game, though. That… is a beautiful page.